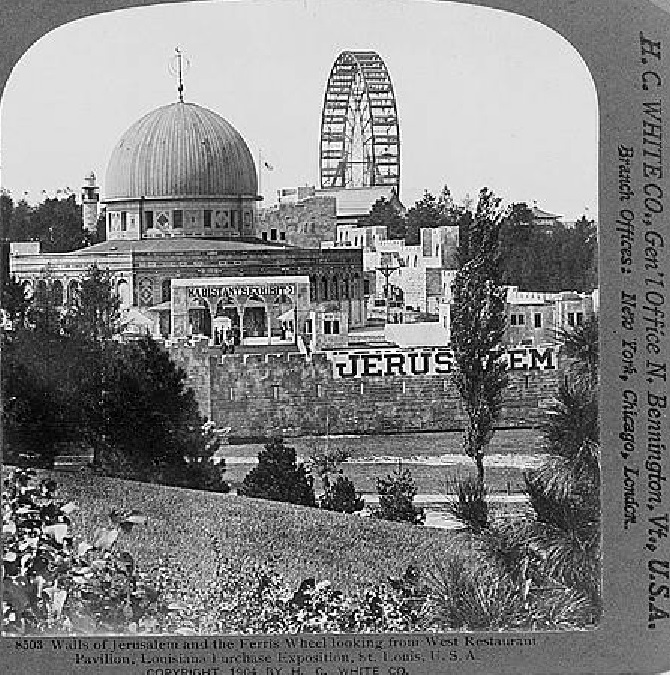 The caption reads "Walls of Jerusalem and Ferris Wheel"
Why is there a Ferris wheel on the Temple Mount in 1904? Because this picture is not taken in Jerusalem, but at the St. Louis, Mo. World's Fair in the United States. The Fair was dedicated to the centennial of the Louisiana Purchase in 1803 (but was delayed until 1904). The World's Fair attracted pavilions from all over the world and almost 20 million visitors. But, as explained in Wikipedia, "the grand, neo-Classical exhibition palaces were temporary structures, designed to last but a year or two. They were built with a material called 'staff',' a mixture of plaster of Paris and hemp fibers, on a wood frame." 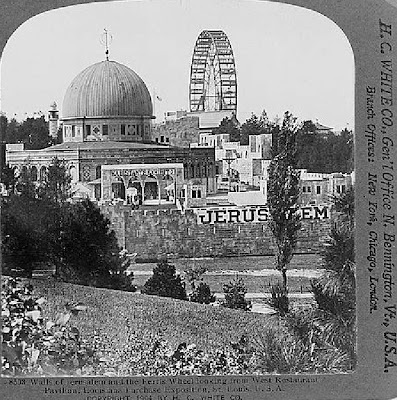 "At the 1904 World's Fair, the Louisiana Purchase Exposition in St. Louis, there was a massive model of Jerusalem's Old City. It sprawled over 10 acres of the fairgrounds and included grand models of the Dome of the Rock and the Church of the Holy Sepulcher. As Israeli scholar Rechav Rubin remarked: 'the most astonishing fact about the enterprise is that several hundred people, Moslems, Jews, and Christians, were brought from Jerusalem to St. Louis. There they lived and worked within the model, dressed in their colorful costumes... and had to entertain and guide the visitors through its streets and sites.'" Extremely interesting and unknown historical facts about the Holy Land! Many thanks to the people who digitized the materials and posted them on the internet.